This is a fun Halloween craft that I used to make with my 5th graders every year. It’s super inexpensive (all you need to buy is the foam balls) and each ghost takes only about 3 minutes to make. 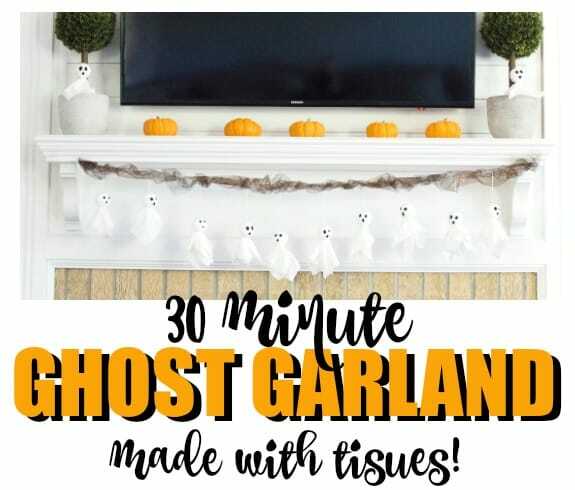 That means you can make the entire ghost garland in under 30 minutes! Place the foam ball in the center of the tissue. Fold the tissue over the ball, creating the ghost like shape. Wrap and tie white thread around the neck to secure. Leave a long piece of thread so that you can later attach to the garland. Using the sharpie, draw the ghost’s face. You’re done! Now repeat this process for how ever many little ghosties you want on your garland! Hot glue the string up the back and to the top of the ghost’s head. This ensures that when each ghost is hung from the garland that they hang correctly. Otherwise it will hang sideways and lopsided! To make the garland, I tied each ghost on to another long piece of string that I hung across my mantel. When I was done, I wrapped the garland in some Halloween themed tuille. My toddler thinks these ghosts are the best thing ever! They are pretty cute and make for such easy decor! While my son is still a little too young to help making them, my students use to adore it – so I’m sure your kids will, too! When someone walks by, the ghosts sway in the breeze!